Do you follow Ms Cheap in the Tennessean? No, then you should. 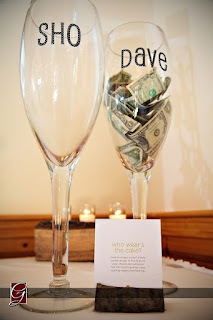 Here are her "cheap" wedding finds for Brides on a budget. Here is an excerpt from her blog! "Do you have a list of places where you can get married or have a wedding reception at an affordable rate?Here’s a listing of some of the more affordable venues in the Midstate that are available for weddings and/or receptions. This list has not been updated this year, but should give you some ideas. –Bridal Path Wedding Chapel (889-6200 or www.bridalpathwedchapel.com), 2415 Atrium Way, offers a wedding for 125 people that includes a photographer, a videographer, a minister and music, plus the altar, candles and pew flowers, for $1,695. It also has a reception package for an additional $1,679. 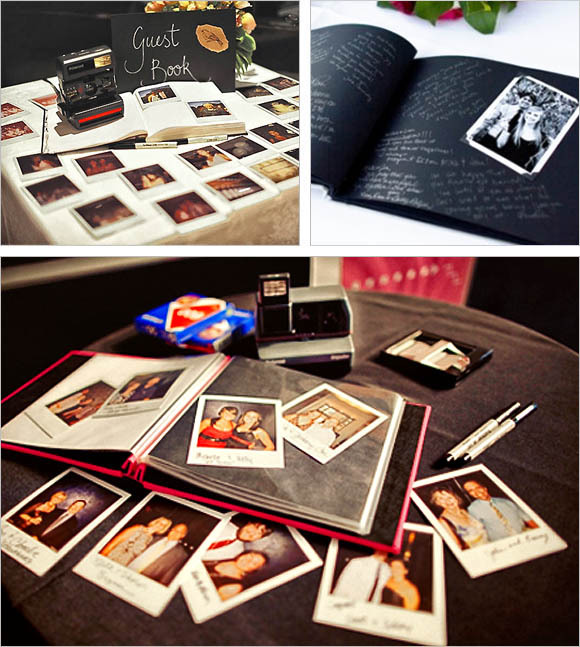 The reception package features a wedding cake, nuts, mints and punch, servers and cleanup. You could add more extensive catering at your own expense. The Bridal Path’s lowest price is the Friday walk-in wedding deal where you can get married between 11 a.m. and 4 p.m. for a flat $160 fee in the chapel or $125 outside in the gazebo. –Wightman Chapel (320-4655) at Scarritt-Bennett Center, which will seat as many as 300 guests, is not exactly cheap at $1,800 for four hours, including rehearsal time the day before. But Scarritt-Bennett also has the small, charming 20-seat Skinner Chapel, which is $300 to rent for three hours. Reception facilities, where alcohol is prohibited, are available for a separate fee. –Buchanan Log House (871-4524, www.buchananloghouse.com) 2910 Elm Hill Pike. This historic home is available at a rate of $600 for six hours. That includes access to a kitchen, 48-72 chairs and several tables inside. The back yard can seat 150, and if it rains, you can move inside and everyone stands. –Cool Springs House (371-0060) in Crockett Park in Brentwood rents $100-$350, depending on when you want it and whether you live in Brentwood. Brentwood residents get a discount. Price includes some tables and chairs and all of the indoor space, which would accommodate the wedding party and 125 guests. 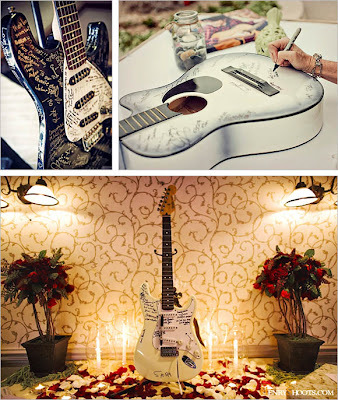 There is a $75 cleanup fee and you can bring in your own caterer and music. –Two Rivers Mansion, (862-8431, ext. 233) 3130 McGavock Pike, stays booked up and is $1,000 to rent - including includes chairs and tables inside the mansion. –The Iris Garden at Ellington Agricultural Center, which is maintained by the Middle Tennessee Iris Society, is another great spot for a daytime or early evening wedding There is no set rental fee but they ask for a minimum donation of $100 – to support the society. Weddings and/or receptions can be held most any time between April and the first weekend of October, with a few dates blacked out. The peak blooming time for the Iris is late April/early May but the garden is lovely throughout the season. 883-4338. –The Shelby Street Pedestrian Bridge is another good bet. If you are going to be there less than an hour, chances are they will not charge you anything. But if you want to close off the bridge and have it all to yourself for the day, it could be $1,000. 862-6024. 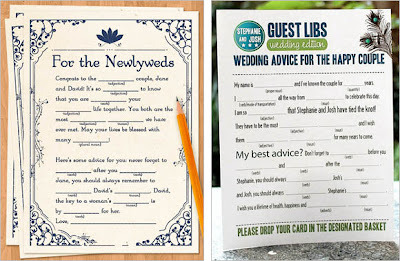 –The Wedding Book, The Big Book for Your Big Day, by Mindy Weiss with Lisbeth Levine, Workman, $19.95. This book is a great resource every step of the way. –Bridal Bargains, Secrets to Throwing a Fantastic Wedding on a Realistic Budget by Denise and Alan Fields, $14.95, Windsor Peak Press. It’s full of good, useful information and is written with humor and lots of detail. –Cheap Ways to Tie the Knot by Cara Davis, $11.95, Relevant Books. This new little book shows you how to plan a church wedding in less than six months for about $5,000 instead of the norm, which the author says is 11 months in planning and a cost of $27,000." Probably the first thing you should reserve is your wedding venue, or venues. Here is a list of some of my favorite venues in Middle Tennessee, and a few that I have found along the way that may fit your individual wedding needs! NEW The Bridge Building-Capacity for up to 1000 people. Enclosed and rooftop options. Rose Mont Mansion- Capacity for 200, rental start at $600!!!!! NEW The Carousel House-Indoor capacity limited to an intimate setting. Outdoor endless opportunities. Hello Brides, Prom Committees, and various other party planners. 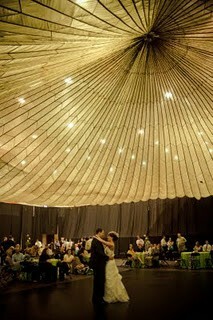 I have had LOTS of inquires about the lovely parachute that was hung from the ceiling during our wedding reception. Good News: The Parachute, and black drapes are alive and well. Bad News: You have to live, or want to get married near Springfield, TN to take advantage of the items. The venue we rented for our wedding reception owns the parachute, They rent out all their items ala carte style for internal use ONLY, so the drapes and parachute were two items we took advantage of on site. How can you get your hands on a parachute? You might try and see if your local Armory or Air National Guard have "retired" cargo parachutes in storage you could rent or borrow. They hung the parachute with string on each line of the "chute" The venue was a gym before it was transformed into a wedding reception venue! The lights are just old gym lights nothing fancy, just camouflaged by the parachute. The time has come again for Holiday parties, and casual and formal gathering of friends and loved ones. So here is a little etiquette 101 for ya before you head out to your BFF, Grandma's, mother in law, etc. Be Punctual where guests freely come and go), punctuality is not much of an issue. However, for more formal events (like dinner parties), guests should arrive within fifteen minutes of the time specified on the invite. Avoid Showing Up Early - By the same token, make sure you don't show up too early; as the host hastily takes care of last-minute preparations, you are likely to become more of a hindrance than a help. Don’t Bring Along the Uninvited – It’s considered extremely rude to show up with an uninvited guest in tow, so only bring a guest if the invitation requests you do so. Make sure you RSVP for your guest as well also the host can get an accurate head count. Say Hello – Seek out the host of the party to say hello within ten minutes of your arrival. Also, don’t be shy! Be courteous and say hello to other guests while mingling. Hold Your Liquor – Even if the wine is flowing freely, avoid drinking too much. Few things are as disrespectful and uncomfortable at a party as a drunk, obnoxious guest, particularly at more elegant affairs. Keep Conversation Light – Party conversations should be kept light and casual. Avoid weighty subjects including marriage, religion and serious politics. In a similar vein, avoid gossiping, especially about other party guests. Chances are, word will spread and you could be finger-pointed as the source. Gauge Your Exit – If an invitation lists a specific end time, don’t linger much longer – you don’t want to overstay your welcome! If no end time is listed, monitor the other guests and when about half are gone, you should get ready to leave as well. Give Proper Thanks – Always thank the host or hostess for throwing a great party before you leave. For more formal events, send a thank-you note within one week of the party. There are LOTS of new ideas for "sign in books" these days. I have seen everything from finger prints, to photo booths. 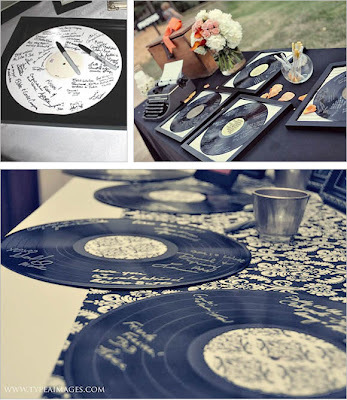 If you are thinking of getting creative with your sign in, here are a few ideas that might be fun for your guest. Who doesn't love a good Mad Lib! I am NOT a huge fan of the dollar dance. In fact I cringe every time I hear a DJ call for it. I think its a crappy position to put your guest in. They have traveled to your wedding, bought you a gift, hired a baby sitter, etc., and the last thing they need is a nagging DJ telling them how cheap they are. WHEW ok, there I said it. If you are a fan of the dollar dance, but maybe want to get a little classier with it, here is something new from the inter-webs. It is "Who get's more cake in the face" How it works? You put two glasses with the Bride and Grooms name on it next to the cake with a little note stating the glass with the most $$$=the Face with the most cake in it!!!! Fortune Teller at your wedding? 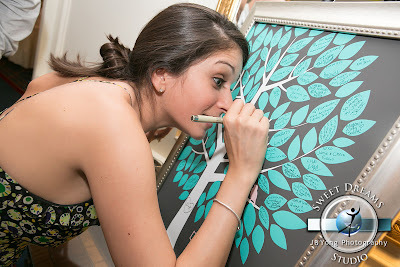 This is a totally fun idea that gives your guest something to do while the food line is dying down, or during cocktail hour before the festivities begin.